The primaries for the 2010 Congressional Mid-Term Elections are over and included some results within the Republican primaries that many are describing as upsets such as Christine O’Donnell’s primary victory in Delaware. Yet, upsets or not, these are the candidates we, the People have chosen to array against the Liberals in these elections. The primaries are a proper time for internecine struggle but those times are now past, their issues decided. It is time now for we, the People to stand shoulder-to-shoulder with our brothers and sisters in arms and present a united front to America’s enemies. We must move and fight as one if we are to be victorious. In the words of many, many centurions of days gone by, “Cuneum Formate! 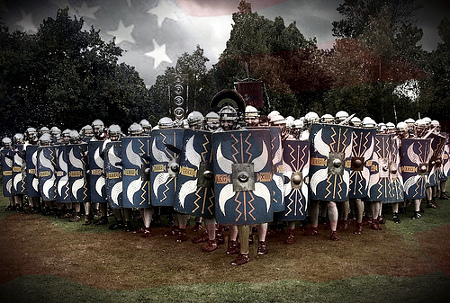 Porro!” These are the ancient commands of the Roman Legion that meant to form a wedge formation and attack the enemy. This entry was posted on Sunday, September 19th, 2010 at 4:15 pm and is filed under 2010 Election. You can leave a response, or trackback from your own site. And, the enemy is whom? The enemy is within, splitting the nation. Small groups of extremists, left and right oriented, are driving a wedge into the masses. Europe released news about the economy today in countries who have imposed austerity measures. The countries are deflating and Germany is feeling the pinch. Japan and China’s finger pointing over a ship’s captain has resulted in China withholding much needed raw materials from Japan. In California, the government has no budget and the people in government don’t really want to fix it and their eyes are closed to the people’s suffering as payments will be delayed or useless IOU’s handed out. This is turning into a repeat of history, one which we never thought would happen during the dawn of the 21st century. I don’t think this is the work of “small groups of extremists,” ichabod. It’s too pervasive for that.